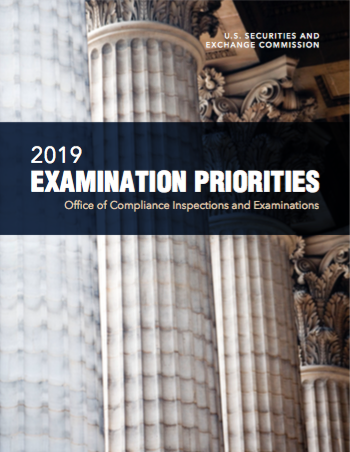 On December 20th, 2018, the SEC's Office of Compliance Inspections and Examinations (OCIE) announced its examination priorities. Particular emphasis will be on adviser fees and expenses as well as digital assets and cybersecurity. With over 1,000 employees in 11 regional offices, OCIE completed over 3,150 examinations in 2018 representing a 10% increase from 2017. Examinations led to more than 160 Enforcement Referrals and resulted in firms returning more than $35 Million to investors. Total Assets of RIA's increased to $84 Trillion. Adviser Expense Misallocations. OCIE staff has observed advisers to private and registered funds that misallocated expenses to the funds. For example, staff observed advisers that allocated distribution and marketing expenses, regulatory filing fees, and travel expenses to clients instead of the adviser, in contravention of the applicable advisory agreements, operating agreements, or other disclosures. Such scrutiny has been also been given to insurance premium allocation methodology. Our advice is develop and document such methodology and adhere to it. Further, OCIE will continue to prioritize Cyber Security and will focus on network configuration, access rights and controls, data loss prevention, vendor management and incident response. We continue to work with our clients in understanding the nuances of Cyber Insurance protection and the importance of implementing an adequate incident response plan to help address and mitigate a Cyber incident. For a link to the 2019 SEC OCIE Priorities click here or the thumbnail above. Stay tuned for upcoming webinars on Cyber Security and Incident response from our Alternative Asset Management Team. Lou D’Agostino is a dynamic senior insurance professional with nearly 17 years of experience in the financial services industry. He is presently serving as Principle of Iron Cove, a division of EPIC Brokers. In his current role, Mr. D’Agostino oversees a group of talented insurance professionals that offer a full suite of insurance products and consulting services to some of the nation’s wealthiest families/high net-worth clients and largest organizations. He is dedicated to business/new product development and large account placement, resulting in a proven track record of successful negotiation of even the most challenging of claims such as Madoff, investor litigation, and SEC/DOJ enforcement. As part of his work at Iron Cove, Mr. D’Agostino’s expertise has been called upon by a variety of industry trade groups. He has presented to the Financial Executives Alliance (FEA), the NYSSCPA, and other peer groups on a wide array of insurance related topics. He also presented at GAIMops, a leading financial services conference focusing on non-investment operations, on the topic of AIFMD and the associated insurance implications. Iron Cove is a Division of EPIC Brokers and represents over 400+ Financial Institutions. With over 1500 Employees, 50 Offices in the US and over $500mm in annualized revenues, we currently rank as one the largest privately held insurance brokerages in the US. Iron Cove has been named Best US and Global Insurance Provider by Hedgeweek Two (2) years running. Copyright © 2018 Iron Cove. All Rights Reserved.